The Web Pro was contracted by Flying Fisherman to provide a completely updated, more modern appearance to their existing website and to add features which will make the new Flyingfisherman.com a professional finished product to serve the organization for years to come. Our biggest project of 2014, it involved updating the layout and style of over 300 individual product pages, developing a completely new professional and modern look for the site, converting old code to new high-level components and forms with AJAX-ready scripting, and putting it all under a consistent design and easy-to-use interface for their customers. 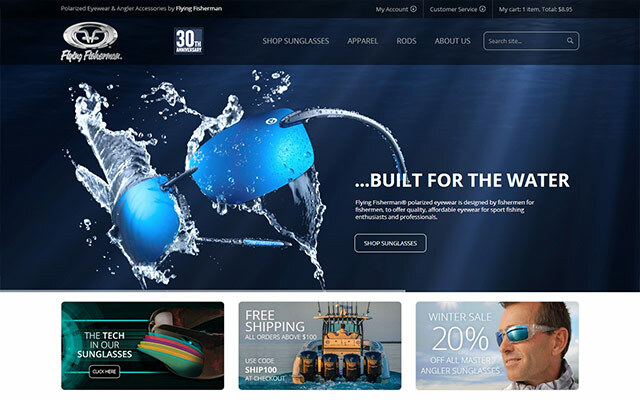 The new Flyingfisherman.com website was built on top of a Shop a la Cart E-commerce platform to manage the company’s online sales. I just want to say how pleased we are with the new website. It’s everything we were hoping for. I know it was a lot of work, but what a major improvement over the old site. Kudos to you and your team for a fantastic job!! Flying Fisherman provides polarized sunglasses and angler apparel and accessories designed by fishermen, for fishermen, and put to the test every day under intense conditions by some of the best sportfishing guides in the world… professionals that make their living guiding anglers to some of the greatest sportfishing opportunities in continental America.